What’s odd about this particular question is our standard transport class which this company took doesn’t even delve into the precedence table. This is because that particular table comes as part of classifying a material which is an entirely separate course. So, here was my response. If your product is a mixture of flammable and corrosive materials in the same bottle, then you need data on that mixture as a whole. You can’t just take to the 2 shipping descriptions and decide on a new name. You have to find a proper shipping name that best fits based on the chemical and physical properties of the mixture. This was not going to be a problem for this particular company as they have testing equipment on site. Once you have data, go through the process of finding a proper shipping name by asking a few basic questions. Is this a pure substance? Obviously not, but …. Is the mixture composed of chemicals in the same chemical family? Based on some other information provided, the answer to this question was also no. Do you know exactly how this mixture will be used such as paint, perfume, or fuel? Not really was the answer I was given. Is there a generic name based on the hazards presented and known data that will fit? Given what was discussed something like Flammable liquid, corrosive n.o.s. or Corrosive liquids, flammable n.o.s. but that is why you need data. After mixing these things it may no longer be flammable or corrosive. To make the decision on the last question once you know the hazard classes based on testing, that is where the Precedence Table comes into play. If you know your mixture is a flammable liquid in PG III and a corrosive liquid in PG III, go to the precedence table. The table shows the Class 3 takes precedence over the 8. 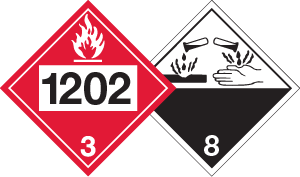 This means between the “Flammable liquid, corrosive” and the “Corrosive liquid, flammable” options for names you would use the “Flammable liquid, corrosive” name. You are still going to need both labels on the box and because of the “G” in column 1 for that particular entry, you will need to supplement the proper shipping name with some technical names. Overall, it was a great learning experience for these folks who are just stepping into the world of transporting hazardous materials. If you are a current customer of ours, have you ever taken advantage of our help desk? It is staffed daily with at least 1 but usually 2 Regulatory Specialists. We are all cross-trained in the various transport regulations (49CFR, TDG, IATA, IMDG) as well as OSHA HazCom2012 and WHMIS2015. Give us a call the next time you get stuck. We are here to help.